When is one allowed a free pass to use "super" in the title of his / her band name? If you boil down the CV of those participating in Bruit court-circuit, you get a PhD in art, one in composition, collaborators with Jandek, Chris Cutler, Fred Frith, Jo�lle L�andre, Zeena Parkins; a co-founder of Ambiances Magnetiques, a former touring member of Gilles Ste-Croix's horse circus Cheval-Th��tre, an educator of improvised music (presented to 4th and 5th grade classes) and the lynchpin triangle of Michel F. C�t�, Alexandre St-Onge and Martin T�treault, a trio connected five degrees or less with everything exciting in Montr�al during the past decades. Violin (Guido Del Fabbro), cello (�milie Girard-Charest), turntables (T�treault), microphone manipulation (C�t�), saxophones and objects (Jean Derome, Joane H�tu), lots of percussion (Danielle Palardy Roger, C�t�), synth (Vergil Sharkya'), electric bass (St-Onge) � SuperMusic works for me. Bruit court-circuit is not so much a story but a theatrical event where abrupt scene(ry) and costume changes and blurring performer lines keep the audience in continual transport (the clues of pending shifts are roughly scrawled graphic scores on the cover art). For example, the opener "Malgr� tout face A" begins with an uninspired rock drum groove, but we're only four bars in before the discord of a two-minute rivulet of declarative, dotted bursts from all participants skews the direction; each player's multi-variations here, from hardbop runs to R&B licks to fizzing wah-wah to pointillism to hints of Serialism to Bartok quotes to someone's metal growl of "�lectrocution! ", declare "prepare to be astounded". Without notice, the work breaks with an intermission of tapping / blips / sforzando and moves to a soothing female spoken-word performance with the ensemble punctuating and creating subtle intrigue alongside the recitation. Just as the drama is about to peak, the woman's voice skips, continues on with just the repetition of "le sp�cimen moderne" and the sound a turntable makes when you bump into it, and you note the illusion and play on recorded medium (presumably) T�treault just pulled. Clever boy. "Acouph�nes en partage" (translated as "sharing in tinnitus") breathes like passive Gagaku with a group effort of high-pitched, sustained notes and "natural" (as in the random "placement" sounds you hear walking down the street) thumps and ticks, the players eventually embellishing with vibrato and breaking the steady tandem texture as an overwhelming deep tone sneaks in underneath. And then a switch to rumbling motors and a sine wave to mess with your tinnitus, and then passages of warbling reeds, a culminating blend of these elements, a disruption of Del Fabbro and Girard-Charest pinching and grinding strings. On paper, Bruit court-circuit appears confusing and odd � in a bad way; summaries of individual tiles that are "occasional down-on-the-prairie fiddle duo sweetness ties an abandoned, irradiated city together" ("Po�me � faible r�sistance") and "a repeating squeal works into an arcade game Boss Battle theme" ("Le fruit du hasard") are curious and accurate, but don't do justice to the aural representation and pattern of the mosaic. 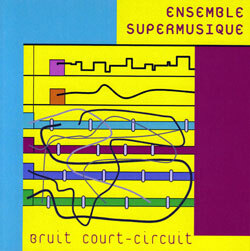 Unfortunately for those who aren't following along with the music in their ears, this unique, vibrant, genre-splattering mix begs a listen to appreciate the meld of Ensemble SuperMusique's technical and creative prowess and virtuosic structural / improvisation narrative. So get on that.